We’re avid knitters of the highest degree. No, seriously- if you ever need to know where we are on our spare time, just look in the nearest quiet corner and you’ll find us knitting furiously on at least one project, with others scattered in little project bags around our feet. 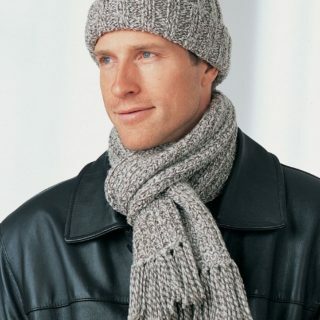 We knit all kinds of things and many of them are your average traditional knitters’ staples, like hats, scarves, and sweaters. 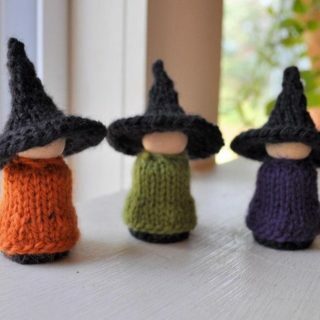 We adore making these things and they’re usually the bulk of what we’re knitting at any given time, but every once in a while it’s nice to change things up and knit something totally random, kind of unconventional, or just plain fun. 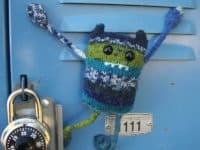 Check out these 12 awesomely unique knitting projects that the other enthusiasts in your local knitting group probably haven’t tried yet (but will probably want to by the time you’re done)! Are you a fairly new knitter who is up for a challenge but still a little bit limited in the kinds of pieces you’ve knit before? 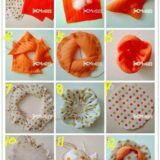 Well, luckily for all of us, fun patterns exist in all different pieces so that we can make fun, unconventional things but still stay with in our comfort zone! 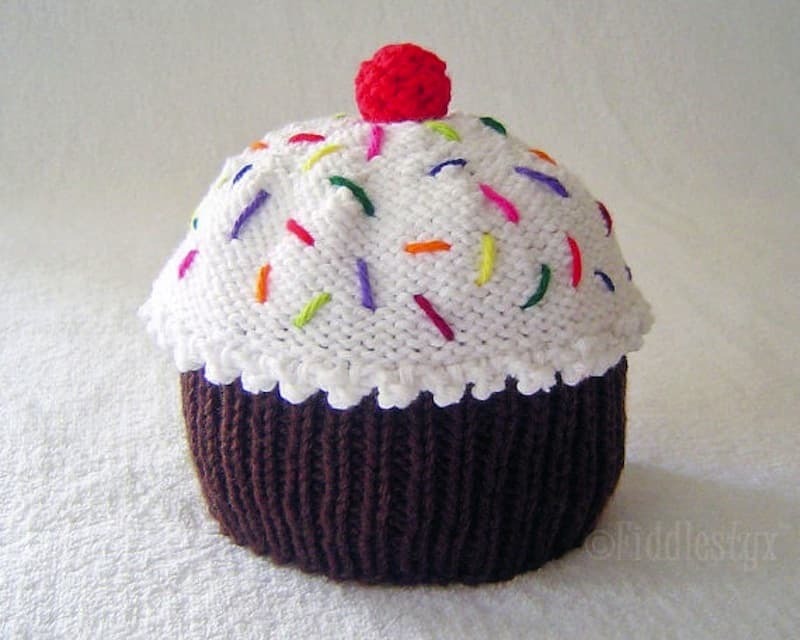 This hilarious little sprinkled cupcake hat by A Knitting Blog is the perfect example of what we mean. You’ve got an easy hat construction and some simple ribbing, but the final product is something unique and different. 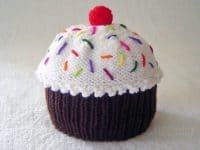 Perhaps when you thought of knitting something “unconventional”, you meant that you wanted it to be unique in its concept, even if it’s quite typical in the style of the final product? 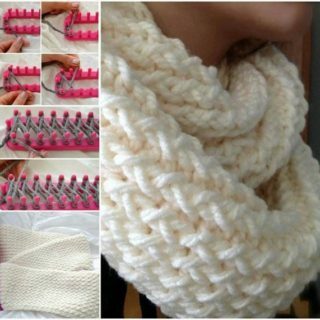 Then check out this awesome mood scarf idea! At the beginning of the project, pick a series of yarn colours and assign each one a mood. Then, every day for a whole year, knit one row in the colour the corresponds with how you feel that day! 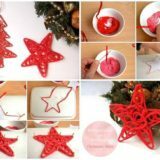 Check the whole idea out in more detail on Leaf Cutter Designs. 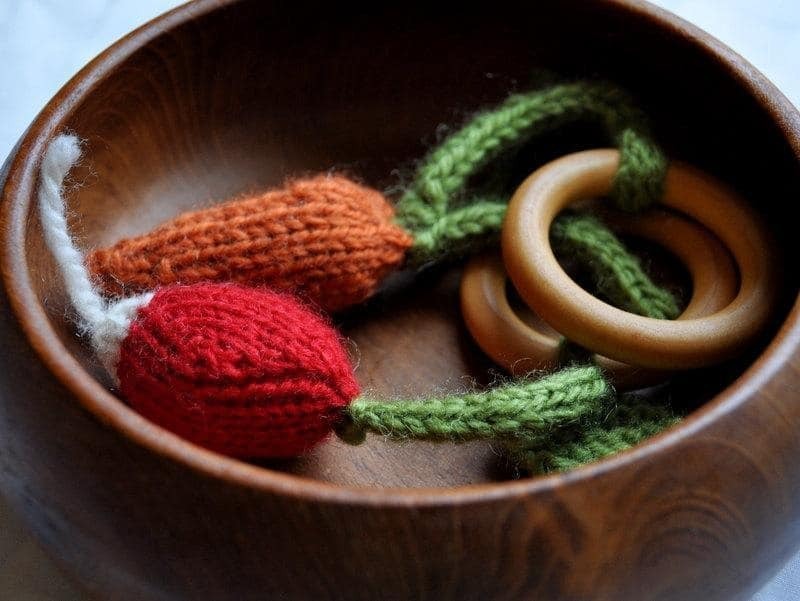 Every knitter knows that winter is prime knitting time. 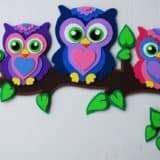 Not only is it the perfect indoor activity during winter months, but it’s the time of year when the pieces that you’ve made yourself and your family will get used the most! With knitwear weather, however, often comes sniffle season. 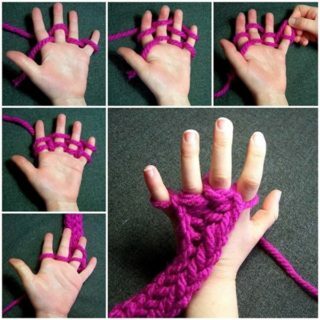 That’s why we thought these “sniffle mittens” from Ellen Rodgers were such a cool idea! 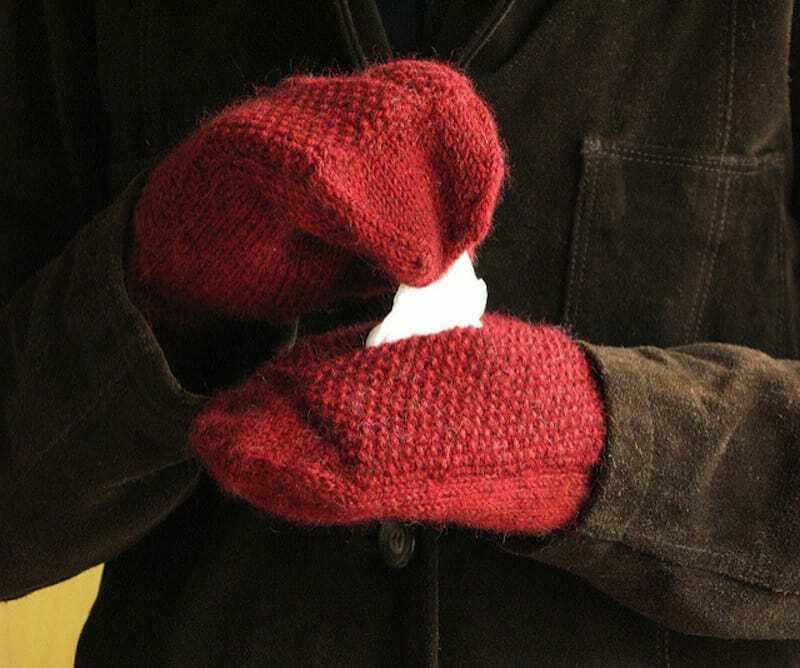 We’ve knit plenty of mittens in our lifetimes, but we’ve never knit ones with a secret tissue pocket in them before, and we’re prepared to knit them for everyone we know this coming winter. Did you love the concept behind the mood scarf idea, but you’re not sure that you change moods enough to really make it an interesting or colourful project in the end? 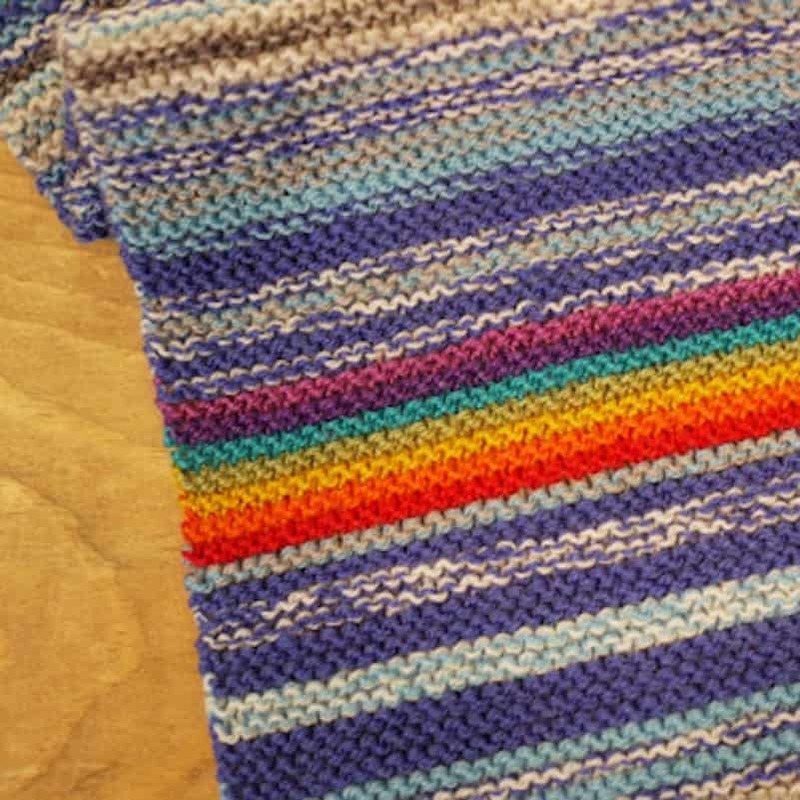 Well, if you’re looking for a daily knit scarf that will probably have more striping, check out this weather scarf from Leaf Cutter Designs instead! 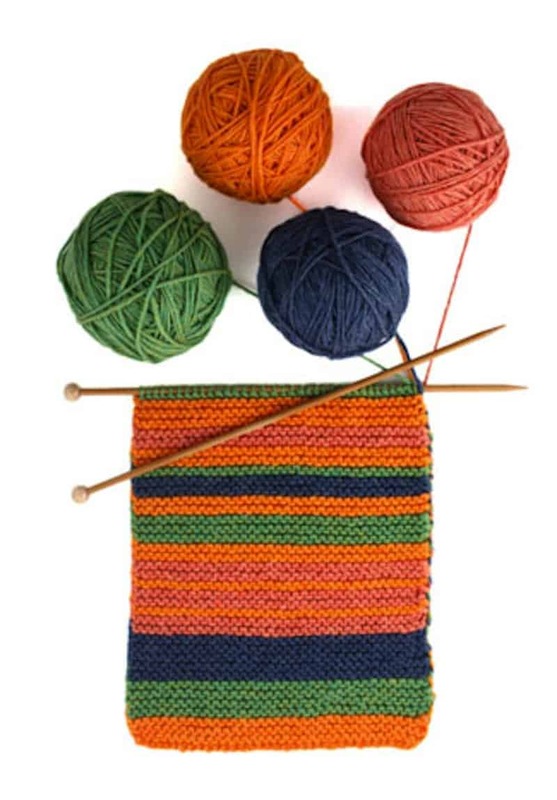 The method for knitting the scarf is the same, except you’ll choose your daily stripe colours according to the temperature outside. 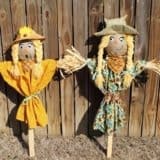 This idea works best if you live in a place that gets distinct seasons rather than mild weather all year round! 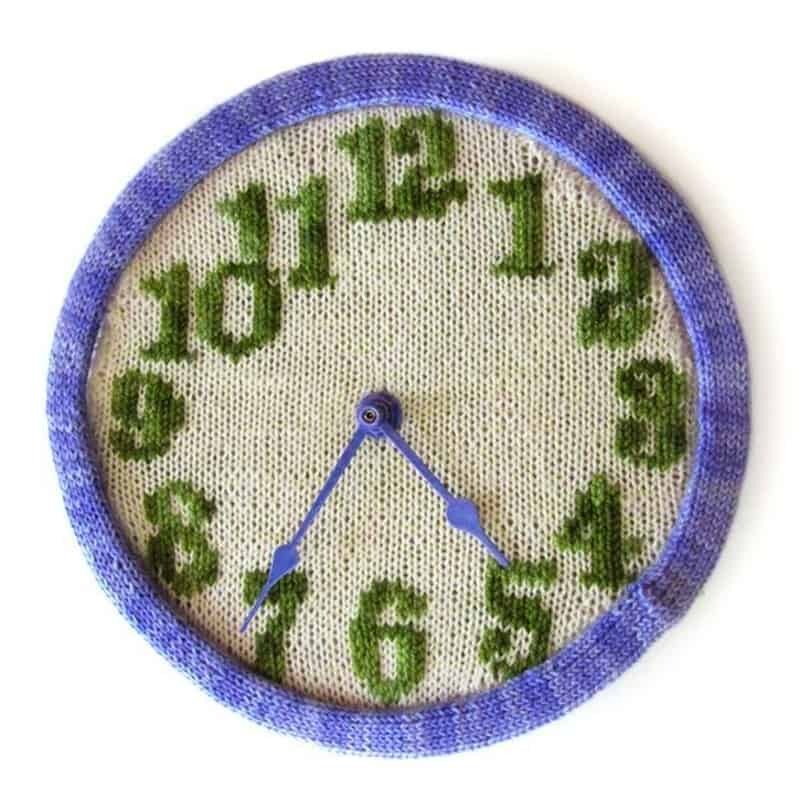 Have you ever seen a knitted clock before? 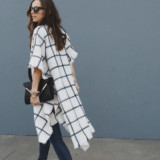 We sure hadn’t, so imagine how excited we were when we came across this pattern! 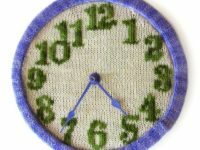 As if the mere idea wasn’t fun enough, this funny little knitted clock by Knit Freedom can actually be transformed into a functional clock by adding some hands and a simple store bought clock motor. Talk about a conversation piece in your home decor! 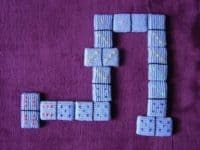 Have you always loved playing dominoes the classic horizontal way, as opposed to building patterns that can be knocked over, so you’re not too concerned about whether your domino set can stand on end? 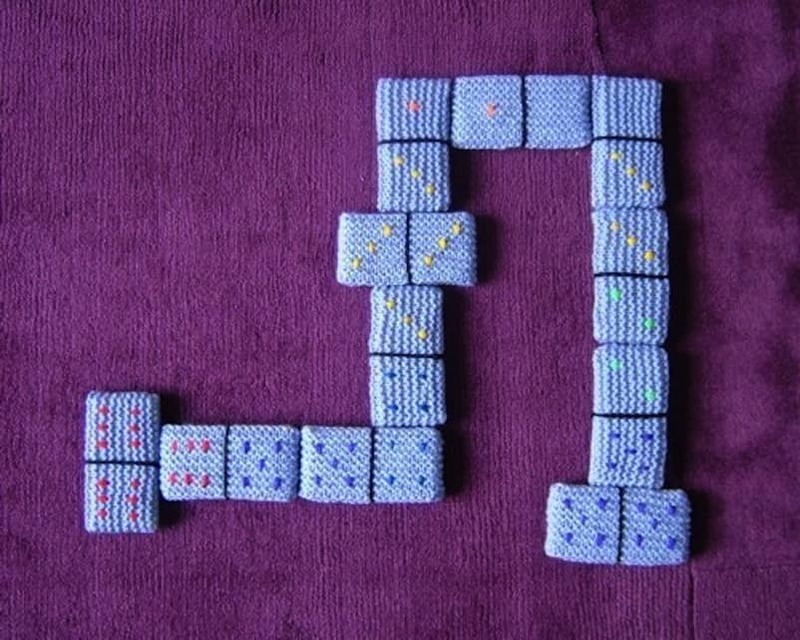 Then check out these adorably knitted plush dominoes from Woolly Thoughts! 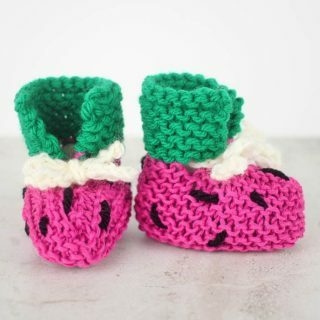 Besides being a cute novelty, they’re also great for playing with little kids who might hurt their teeth on plastic ones if they haven’t broken the habit of absentmindedly putting things in their mouth just yet. Are you the kind of high top runner enthusiast who collects as many different colours, styles, and designs as you can? Well, if you’re anything like us, you’re probably also no stranger to adding a few homemade and DIY versions of your favourite runner style to your collection. 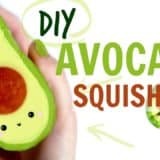 Kamilla is here to show you a new idea that might be unlike anything you’ve made yourself thus far! 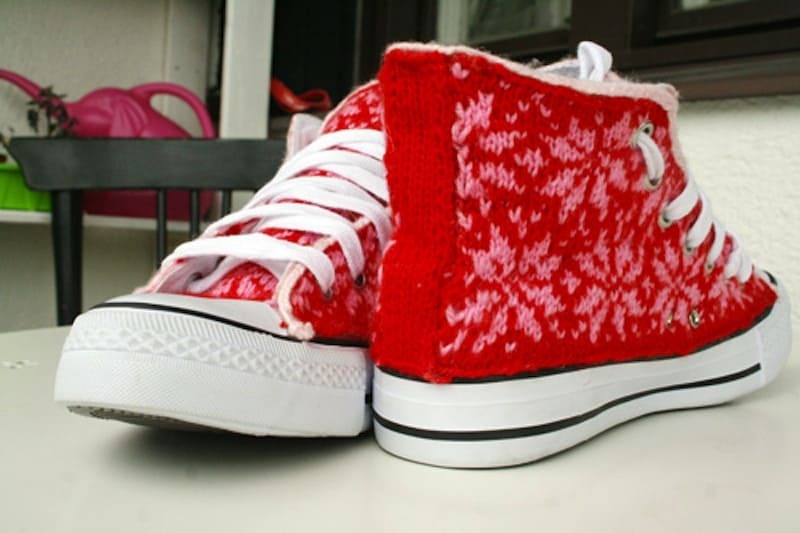 Check out their pattern for knitted high top covers, as well as their tutorial for actually putting the covers onto your shoes. Are you the kind of DIY enthusiast who just loves a good novelty piece, no matter how silly? If you ask us, the more random the object and pattern, the better! 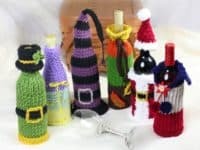 That’s why we were so into the idea of making fun and funky wine bottle covers just like these ones by This Moment is Good! They’ve got all kinds of patterns themed according to holiday, but they’ve also got simple designs that are just plain cute no matter the time of year. 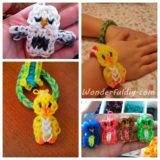 Have you always been a big fan of knitting toys for your kids, but now they’re getting old enough that they don’t really play with toys anymore? 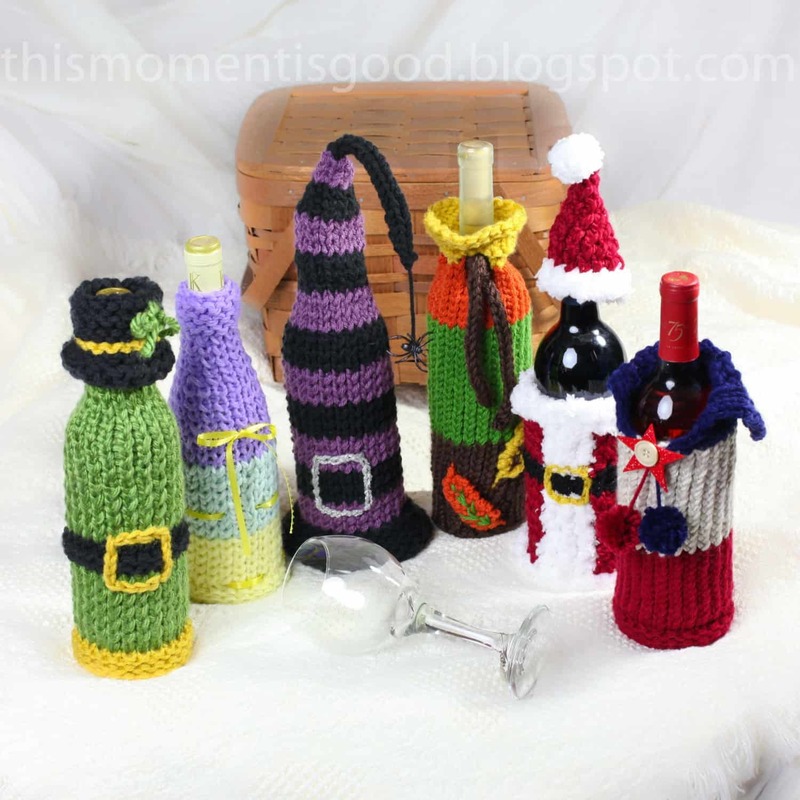 Perhaps it’s time to switch to knitted trinkets and accessories instead! 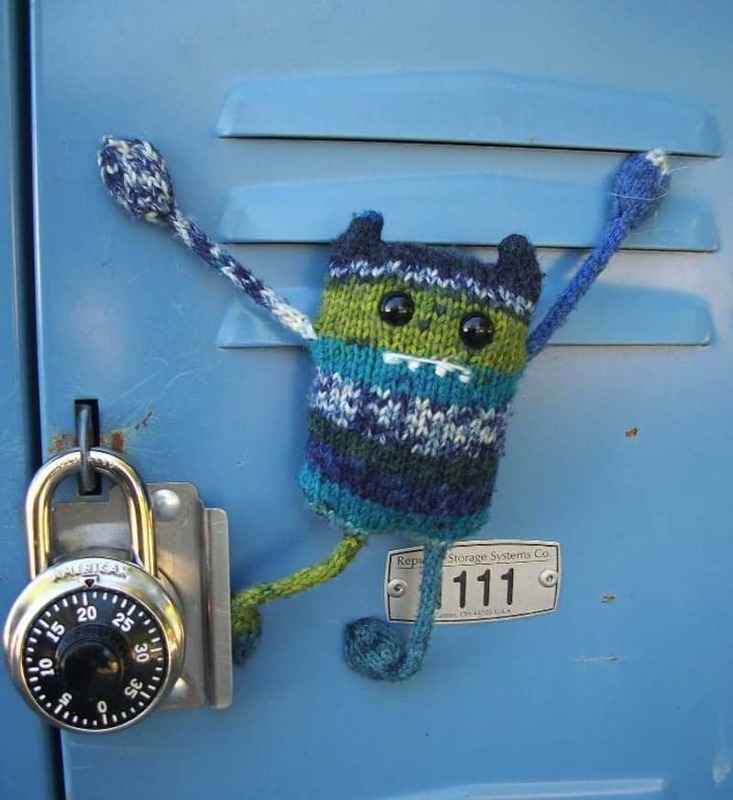 They’ll be particularly inclined to still use them if the things you knit them are very unique, like this hilarious little “locker monster” by The Byrd’s Nest! 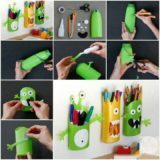 Their tutorial gives you the pattern but also shows you how to put magnets in the monster’s hands and feet so he’ll stick to the metal of the locker door and hang there to cheer up your kid’s day each time they open their locker to switch books between classes. knows as well as any mom that teething rings for babies and toddlers are a lifesaver. Buying endless rings at the store can be expensive, however, so when our kids were little, we opted for homemade ones instead. Making the rings yourself also means you get to customize the fun trinkets attached to them! 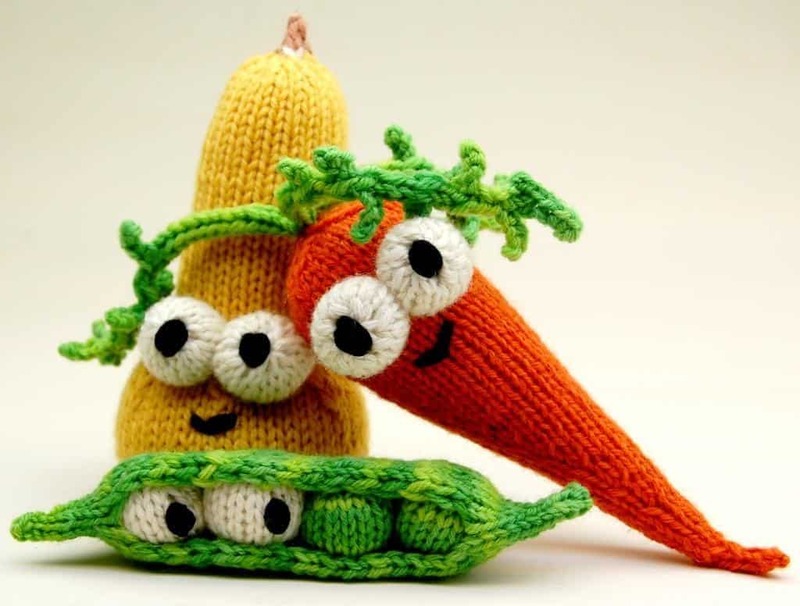 We love this cute knitted vegetable idea from This Cosy Life, and we also think these make a great project for knitters who are just starting to practice knitted shaping and 3D projects. Do you have a friend who loves napping and always insists on getting their “beauty rest” above anything else? 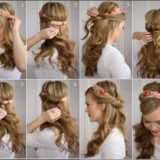 Then Girly Knits, which specializes in funny and unique little feminine knitting patterns, has the perfect unconventional project for you! Check out how they made this funny little sleep mask that features lash-full eyes on one side and the letters “Do Not Disturb” on the other. Did you like the idea of knitting little stuffed veggies when we talked about them in the teething rings idea above, but you’re not really in need of those because you don’t have young children? Then skip the ring part and just knit yourself a series of hilarious plush vegetables! Cheezombie Patterns shows you how to make these nutritious little characters with fun little faces. They make awesome gifts for kids or just cute trinkets for yourself, because why not?